An engine analysis is an advanced system of inspecting our boats drive train. We perform these tests to help catch pending mechanical issues before we leave the dock. An analysis is much more comprehensive than a typical “pre-departure peak” at the engine. We are going to not only visually inspect our engine, but also take a series of measurements that become our baseline for future tests. Our goal is use this engine analysis as a system to help make easy informed decisions about our boats drive system. This is a general once over of the engine looking for blatant flaws. Look for oil drips or other fluid under the engine. Inspect for obvious cracked hoses. Give a gentle bend where a hose attaches to the engine and look for cracks in the rubber cover. Check the fan belts for cracks and loose hose clamps. Grab the alternator pulley and see if it will spin free on the belt. If it does then the belt is worn or loose. Feel the inside of the engine room for oil film. Touch the areas of the engine you can’t see feeling for rust or salt trails. Smell for any burned chemical type odor. Smells can be difficult to locate, but in general any burnt, oily, or diesel smells should be searched out. A good nose can tell the difference between a hot belt and a hot wire. 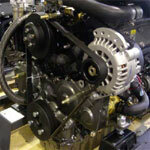 Look over the complete engine for oil leaks. Pay particular attention to the front seal, and the area between the gearbox and engine. 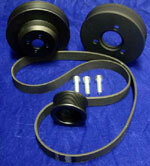 Leaks in the front or rear seal can mean a coming engine rebuild. Inspect the head to block connection looking for oil or water trails. Take photos from all angles as a base line for later use. This is the point where many an engine inspection ends, but in an analysis we want better scrutiny to help build confidence in our propulsion system. Oil is the lifeblood of our engine. It lubricants, cools and quiets our engine. But how do we know if the oil is doing its job? Begin by pulling the dipstick. Smell for signs of diesel odor. Pinch a small dab of oil between your index finger and thumb and expand slowly to see how far you can spread the oil before the gap opens. Compare this gap to new oil and take down the difference for your notes. This is a crude method of checking viscosity and diesel intrusion. Open the oil fill and look inside the cap for water droplets, condensation or worse, a gray gooey substance indicating water penetration into the oil. Put a small drop of oil on a paper towel and compare it to a new oil drop. Note the amount of black carbon and any shiny deposits. A more careful inspection can include an inside look at the oil filter. Next time you change oil keep the old filter. Leave it to drain upside down then cut open the canister and look at the inside of element. It’s the inside that will contain any heavy deposits or worse, metal shavings. Take photos for later comparison. Immediately after start up note the oil pressure and again during our bollard pull test and lastly immediately upon reducing throttle after our bollard pull test. Does the gauge needle dip? It should remain steady from start up and through all the following tests. A dipping gauge can indicate a faulty pressure release, or worse, worn engine bearings. A typical yacht engine has two cooling water loops, fresh water and raw water. Lets look at the fresh water loop first. Open the expansion tank cover or the heat exchanger cover or where you check the coolant water. The reservoir should be filled almost to the top with coolant. A low coolant level can mean a small air leak in a hose. Check the coolant for oil. It should look new and fresh. The underside of the cap should be clean. NO brown gooey oil should be present under the cap. Any strange colors can mean a failing heat exchanger or failing head gasket or bad heat exchanger. Our salt water system we’ll check by measuring flow rate and using our laser temperature gauge to measure efficiency. Locate your diesel filters. Most boats have two sets, one on the engine supplied by the manufacturer and a set of pre-filters. On the bottom of most any fuel filter will be a drain valve. Drain off a small amount of fuel into a container checking for water, dirt and any long stringy algae. If you find more than a couple teaspoons of water or much dirt then it’s probably time to change the filters. If your filter system has a vacuum gauge then note the readings in the log for future comparison. The engine control system is what directs our intentions to the engine and they are one of the most important inspections you will make. 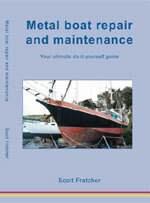 If the engine fails to engage in reverse during docking the results can be boat damage or worse. Begin by feeling for play in the shifting linkage. Move the controls through all possible motions feeling for “hard” spots. Does neutral have a detent or “click” to tell the helmsman he is in neutral? Inspect where the cables attach inside the shifting housing. Look at each split pin for wear. Wiggle and physically inspect each connection looking for cracks, breaks, or anything that looks amiss. Pay particular attention to where the cable cover end attaches to the shift housing. If this point slips we will loose engine control immediately. Move to the engine and check the same cable ends, but this time also searching for chafe from engine vibration. An area where the plastic cable cover has chafed through can let in small amount of water corroding our cable in areas we can’t see causing an unpredictable loss of engine control. Inspect the gearbox to prop shaft flange bolts. Attempt to tighten the Allen setscrews. Loose bolts or setscrews indicate a vibration or miss alignment. Pull the gear oil dipstick. Check level and perform our viscosity check again. Look for water under the cap and smell for any burned odor. Most yacht gearboxes don’t have a filter so any bits of crud or metal keep getting recalculated so it is imperative we keep an eye on the oil. The next series of test duplicate our engine working under load. Were going to pull against our dock lines while safely tied in the marina so can perform a series of inspections. This test can also be performed at anchor if the boat is run hard in reverse or while underway. Note-It is imperative to inspect the dock lines, anchors, and cleats for suitability for such loads. Double up your spring lines and inspect the dock cleats. If you are testing a larger or higher horsepower yacht consider getting underway for this test. Tip-Locate the manual shut down on the injection pump and be ready to shut the engine down if you suspect any problems or hear shouting. Start the engine; wait a couple seconds for oil pressure to build. Were gong to start our tests by checking alternator output. We perform this test early while the alternator is still at full output. Increase rpm’s to 1000. Set your clamp amp to DC and place the jaws around the positive/red cable at the back of the alternator. Check the output and note the DC reading. Change the meter to AC and again note the reading. The AC reading should be around three amps. If the AC reading is near half of the DC reading this indicates a faulty diode. Come back at the end of testing and verify the voltage has stabilized around 14.2 volts. While the engine continues to warm up increase throttle to about 2000 rpm’s in neutral. Take a bucket to the engine exhaust and time how long it takes to fill. This number will come in handy if you ever suspect a failing impeller, clogging raw water loop, or clogged exhaust riser. Wait for the engine to warm up (maybe five to ten minutes). Put the engine in forward (reverse if this is a test at anchor). Slowly bring the engine up to half throttle. Check all the dock lines one more time. If all the lines and cleats appear strong then increase the engine to full throttle. Note the maximum rpm’s obtainable. If you have a handheld tachometer then compare the engine results to the helm gauge. Note any difference so later you can make an rpm correction table. After maximum rpm’s have been reached reduce them by 200 for testing. For example a typical Yanmar might have a max rpm’s of 3600, but would only reach 3400 pulling against the dock lines thus should be run at 3200 rpm’s for the remaining load tests. This way we are running the engine hard, but not overloaded. Look at the engine mounts. They will be taking the thrust of the engine and should be compressed forward. Inspect them for any indication they are “rolling out” indicating a coming failure. Even under strain the rubber mounted studs should still sit vertical. Look for metal-to-metal contact in the base. Note-At the end of the bollard pull test run the engine hard in reverse and come back and check the mounts one last time. Take photos of both forward and reverse thrusting mounts for later comparison. As the engine comes up to full temperature you might see signs of smoke. Determine if the smoke is escaping from the engine or if we are simply “gassing” off an old oil/dirt film. Pay particular attention for smoke escaping from between the engine and exhaust manifold. This may be combustion gas that could contain carbon monoxide Carbon monoxide is a dangerous, colorless, odorless gas that can kill when released into confined spaces. Move to the back of the engine. Take a good look at the shaft to gearbox coupling. It should be sitting almost perfectly smooth. Any pumping for and aft motion could indicate failing engine mounts. A circular motion could be a bent shaft, out of align engine, or possibly damaged prop. Look at the packing gland for the amount of water dripping past the shaft into the boat. Compare this to the manufacturers recommendation. Be sure to note the amount of drips over a sixty second period and write this in the ship’s log as it’s a common point for crew to worry about. Begin by scanning the gearbox looking for hot spots. Pay careful attention to the area of the case around the clutch packs, and the gearbox output bearing. If any part of the gearbox is going to build up heat it will be during this bollard pull test. The complete gearbox should be under 80C, and 60C is typical. Continue checking with the laser gauge along the cylinder head. It should show about 75-85C everywhere. There should be no hot spots. A hot spot would be more than a five degree C change in the head from one end to the other. Note-Testing the area directly around the exhaust manifold does not count as a “hot spot”, as this will be hot due to the high temperature of the exhaust. Check the oil temperature by shooting the oil filter or oil pan. The oil temp should be about 7-10C above the head temperature and not above 95C. Check the inlet to the salt-water pump and outlet of the final heat exchanger. With most engines the temperature difference should be less than 10C. A higher temperature difference can indicate an engine producing too much heat (IE failing head gasket) or too little water flow (IE clogged salt water system). Check the fresh water temperature inlet and outlet of the heat exchanger. The difference should be about 10C and stable. You should be able to move the laser along the body of the heat exchanger and show the cooling effect of the heat exchanger. By this method you can see how much reserve cooling you have left in the heat exchanger. The pre turbo exhaust temperature should be about 300-450C. After turbo it should be a bit lower. Check the exhaust gas temp between the cylinders and exhaust manifold for each cylinder. Normal for a loaded non-turbo engine should be 300C. A cylinder temp lower than the rest shows a clogged injector or maybe a dead cylinder. A high cylinder temp possibly shows a leaking exhaust valve, or poor injector spray pattern. Locate the crankcase ventilation hose and feel the outlet for crankcase pressure. If your engine does not have an easily accessible vent line you can also check for crankcase pressure at the oil fill. Slowly open the oil fill and check for “blow by.” Blow by is a the amount of gas and oil mist that seeps by the piston rings and pressurizes the crankcase. Excessive blow by can mean worn out rings. You should not feel any pressure in the oil fill. Testing with a gauge should not show above a pound of pressure. Note-Be careful opening the oil fill, this may release little hot oil droplets being thrown off the rocker arms. If the engine has a turbo, find a port on the intake manifold and check the pressure. Compare this to the manual. Many turbo boost up to 2 bars. Most Yanmar engines boost to 1.1 bar. The pressure should be stable. Any cycling of pressure, or “coughing” can indicate after burning, blow-by, or clogged air inlet. Take one last look for any signs of future problems and slow the engine down to an idle. Check with the laser temp to see if the engine cools quickly (less than 5 minutes). Verify the alternator is producing 14.2 volts. Less means the voltage regulator needs to be inspected, and more may mean we are cooking the batteries causing early failure. Place the jaws of the clamp amp over the positive cable leading to the starter. Clip your voltmeter to the starter’s positive and negative. Hold the STOP button, or manual engine shutdown and then turn the engine over for ten seconds. (The engine should not start.) Note the amp draw. On a typical 40-75 hp engine the reading should be 225-275 amps. Look at the starter for a rated amperage or wattage. (Watts/volts=Predicted amps. They should match) anything more indicates poor cables, a bad armature in the starter, or failing batteries. The voltage during this test should remain above 9.5 volts. The results of this test should be placed in the vessel log for future reference. This is an important test as it indicates if the starter is about to fail and helps trouble shoot later problems. Pull the air filter and inspect for cleanliness. Reach a finger down the air inlet. It should be lightly covered in dirty oil. Any loose oil or splatter indicates a possible faulty inlet valve, or maybe a turbo failing. If the engine has a turbo charger you might be able to reach inside and give the blades a spin. They should move easily with no restrictions, or any “bumps”. For most boties an in-depth inspection of the vessels drive system can mean more confidence, safer travel and a much easier time of finding trouble spots in the future. Remember to keep careful records of all the tests performed so in the future when something has changed we can repeat the tests making short work of the trouble shooting and quickly get back to enjoying the water.